In the debate over Iraq, the Democrats and most allied governments are demanding United Nations Security Council endorsement of a military campaign - or they are against it. This is a strange position. The U.S. government, with an over two-century record of forwarding human rights and defeating tyrants, is to defer to the United Nations? The duly elected leaders of the United States should step aside and let assorted dictators make key decisions affecting American national security? There is a reason for this strange idea, John Fonte of the Hudson Institute reveals in an eye-opening article in the current issue of Orbis magazine. In recent decades, the "progressivism" rejected by America's democratic institutions - the executive branch, Congress, the courts, state and local governments - has been gaining at the United Nations and other undemocratic international institutions. And many Western elites - even more so in Europe than here - have so internalized this change that they now see the United Nations & Co. as more legitimate on these issue. This attempted end-run around American democracy, Fonte argues, represents a significant movement, which he dubs "transnational progressivism." I prefer the name "bureaucratic leftism," but whatever one calls it, Fonte establishes that, in the tradition of fascism and communism, this effort constitutes a significant "challenge to liberal democracy." Fully to absorb its threat requires reading Fonte's article in full. In summary, unable to achieve their goals through the ballot box, law professors, political activists, foundation officers, NGO bureaucrats, corporation executives, and practicing politicians now seek to achieve those goals by denigrating the two central pillars of modern liberal democracy, the individual citizen and the nation-state. The group over the individual: A person's unique capabilities and outlook have less importance than his membership in the ascriptive groups (racial, ethnic or gender) into which he is born. Victim vs. Oppressor : The world divides into good and bad groups, with nonwhites, women, immigrants and homosexuals by their very nature in the former category. Fairness requires group proportionalism: "Victim" groups should be represented in all facets of life (executives, prisoners) proportionate to their percentage of the population. Democracy as power sharing by groups: Democracy ceases to mean majority rule and becomes a matter of dividing the spoils among those ascriptive groups. Victims' values rule: Institutions must shed the outlook of the "oppressor" culture and adopt that of the nonwhite, female, immigrant and homosexual victims. Out with national narratives and symbols: Traditional notions of history "privilege" the oppressors and must be discarded. In the American case, for example, the conventional emphasis on European settlers is jettisoned in favor of a multicultural "convergence" of three civilizations - Amerindian, West African and European. Denigration of state sovereignty: States should cede their powers to higher bodies, such as the European Union or the United Nations. In this spirit, Israel's Foreign Minister Shimon Peres has called for a de-emphasis on sovereignty in his region and argued for a Middle Eastern version of the European Union. Citizen of the world: Instead of giving ultimate allegiance (defined as who you would die for) to the state, a vague loyalty goes to some form of global membership. Immigrant rights prevail: Immigrants should be able to relocate freely, impose their cultures on and offer only ambiguous loyalty to their new countries of residence. Long-established peoples in a region should accept "multiculturalism" with a smile. Although forwarded by progressives and garbed in post-modern lingo, Fonte shows that bureaucratic leftism represents a throwback to a pre-modern age in Europe when rulers were unelected. Today's bureaucrats effectively fill the role of yesteryear's kings. Predictably, the left's newest project is having more success in Western countries other than the United States - Canada, France, Israel and New Zealand come to mind. 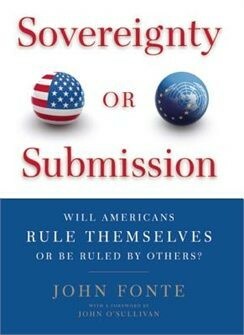 Fonte implies that Americans will end up with the main burden of fending off this ugly system, just as it did fascism and communism - and is now doing with militant Islam. Only by recognizing bureaucratic leftism for what it is can it be stopped before its malign ideas have a chance to do real damage. Related Topics: Conservatives & Liberals, US policy | Daniel Pipes receive the latest by email: subscribe to the free mef mailing list This text may be reposted or forwarded so long as it is presented as an integral whole with complete and accurate information provided about its author, date, place of publication, and original URL.